This week was pretty unremarkable in the long run, and it’s actually to the point where I can’t remember what I did for the first half of it. On Monday I finally got my refrigerator from a second hand shop, a bit sketchy a bit wonky–and that’s after spending almost a month without one–but it didn’t smell and after plugging it in and slapping it a couple times it doesn’t make too much noise either. Alas, I don’t really have an efficient way of hauling groceries around yet. I’m in the market for one of those collapsible rolling carts that I’d always see elderly women use to haul groceries around when I was working in New York, but even those seem a rarity at the most basic daizo. Instead, I’ve been relying on the kindness of my neighbors and trying to make my trips to the grocery store line up with theirs. Everyone likes to carpool right? Needless to say I’m finally in the market for a car. I can’t really afford it with all the credit card debt I charged getting over here, and the continual student loans I’ll be paying off (for the rest of my life), but I think I’ll be able to save up enough by the time snow falls and I really want one. The thing about Japanese cars is they’re dirt cheap on a whole. The thing about those kei cars, is that they’re made out of cellophane and dirt bike motors. It doesn’t help that I’ve got dreams of grandeur and a lust for the Fast & Furious franchise, meaning I’m only in the market for something that will boost my pride. Luckily enough, without a car I’m not going to be going out and spending money as much, and my salary has enough of a contingency where I think I can set enough aside for multiple savings. One thing I did learn this week was how to send money over to my American bank account. Because of the aforementioned loans (and probably heavily on the fact that Japan is a cash based economy so my cash card is almost entirely limited to ATMs) I still have to keep my bank account open in America. Unfortunately, through living alone, paying off loans, and making the move to Japan, I wasn’t able to save… well, let’s just say I did the opposite of saving and now that American bank account is pretty low. Thus, I have to send over money from my salary every month to keep up with those payments. Really, it’s something I could have fixed with a little more planning ahead (i.e. starting a savings back in November when I first applied), but alas is still a habit that I haven’t quite figured out yet. Thankfully I’m great at making a budget, and have only recently started becoming good at adhering to it. Anyway, enough of the Pity Party. The point of the above story, is that I tried to figure out how to send money home. The easiest and cheapest (although by cheap I mean ￥2500) way to send money home I’ve found is through the post office. In the grand scheme (now that I’ve done it) it really isn’t too hard, but being I went to the post office alone twice (to get the form, and return it) my confusion rate got double the dosage. Eventually I figured it out–with some help from my advisor–but really it’s starting to wear me out. It’s the same thing that happened when I was in the hospital getting stitches. Then I was lost when they were asking me if I had any allergies, and here at the post when I was sending ￥80,000* (a meager $572 due to an American economy that just doesn’t want to give in to a crumbling China) I was running in and out of understanding if I could confirm my bank account number. Between my health and wealth, a small misunderstanding could have really screwed me over and I think it’s really the best motivation for me to start studying Japanese. And that’s actually what I’ve started doing. 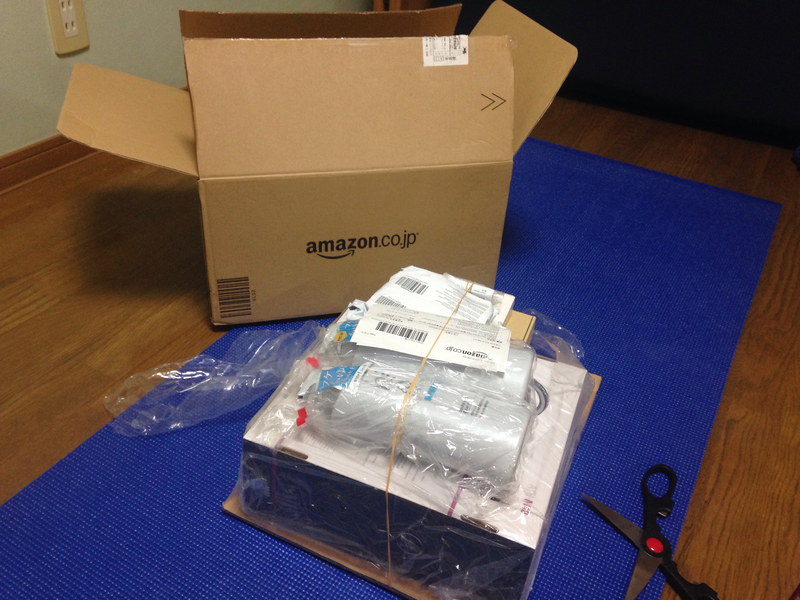 I almost lost sleep over it, one night not being able to fall asleep, scanning Amazon,jp for the books that I used in college, and almost walking to the nearest conbini to pick up a gift card so I could order them by the end of the week. Ironically, after finally making the debate to ignore the impulse buy I randomly found that I had a complete set of my first and second year textbooks and workbooks downloaded onto my hard drive. Thank goodness, I’ll only be spending my Amazon points on hedonistic materialism. Speaking of which, perhaps the highlight of my week was not getting a refrigerator, nor was it spending another hour at Nitori (my second favorite place in Japan), or even making my plans for the end of September holiday to go to Tokyo. No, the actual highlight of my week was Wednesday evening and the arrival of my Amazon wishlist. I think I mentioned before how (along with peanut butter) I’ve been longing for some emotional stability through playing high quality music loud. Well, wishes fulfilled as I unwrapped: audio technica headphones (because I left my last ones at home, not even near my suitcase), a bluetooth speaker, and among other things, a desk clock, an iPhone wall charger (previously left at the airport), and unbelievably itchy scalp relieving shampoo. The first thing I did was put on the headphones and cook dinner from dry goods. They stayed on the rest of the night and I could physically feel my dopamine levels increase. Posted in Planning.Tagged budget, expectations.